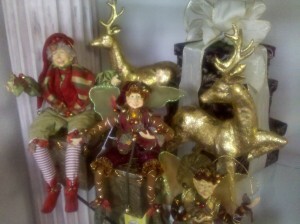 Home » Gift Baskets » Elves, Reindeer And Snowmen, Oh My! Elves, Reindeer And Snowmen, Oh My! The decorative elves and reindeer at The Best To You look so excited to be out of the box and in the showroom greeting delighted customers! The snowman cookie jars and stacking boxes are unpacked, and ready to be filled with decadent cookies, chocolates and confections. The shop is brimming from floor to ceiling with gifts for every personality and gourmet goodies to please even the most discriminating client. The elegant new leatherette containers and rich looking mahogany colored baskets are stocked along with the festive burgundy tin buckets splashed with white snowflakes. Golf gifts, upscale leatherette wine carriers with all the accessories, picnic bags with service for two, and elegant candle vases that come in gorgeous black and ivory satin boxes, just to name a few items. Chocolate dipped Oreo cookies, Peppermint Cocoa Kits, hand made chocolate truffles, Triple Chocolate Cookies bottomed in white chocolate and lemon rasberry gourmet cookies are just a few of my personal favorites. There is a frenzy of activity and the work benches are filled with Holiday baskets of all sizes and types being created for our valued corporate clients. I love Holiday time at The Best To You! I love the over stocked shelves,candle aromas, the Holiday goodies, the music, the gorgeous designs we create, the good will and joy we deliver, and especially….hearing from so many clients and friends! Happy Holidays!